Keep all your information in one place and easily find anything you saved once. No more making up categories and struggling to fit the new info somewhere just to forget the place later. The idea is to label every data with some keywords and search later using those keywords. For the worst case scenario we still have a full text search for you. The data import feature can load new or modified info. Keep all your information in one place using labels. ...... For the worst case scenario we still have a full text search for you. Of course you are keeping notes at work and at home every day so want to keep those things in one place: the data import can save the day, it can load new or modified info without you to remember where the latest edit took place. The best way to see how InfoCenter can help you is to download, install and run it now! 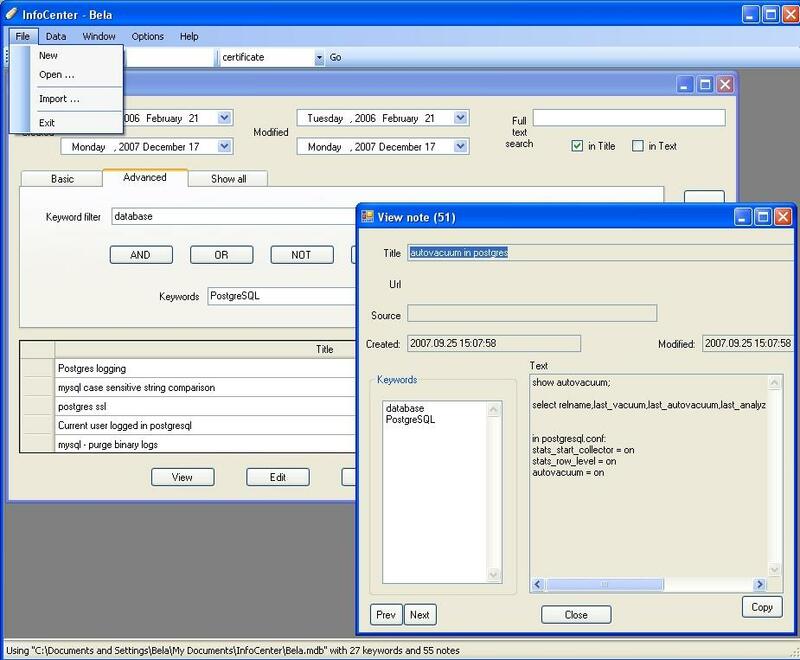 Qweas is providing links to InfoCenter Free 2.0 as a courtesy, and makes no representations regarding InfoCenter Free or any other applications or any information related thereto. Any questions, complaints or claims regarding this application InfoCenter Free 2.0 must be directed to the appropriate software vendor. You may click the publisher link of InfoCenter Free on the top of this page to get more details about the vendor.